The year was 1998. Gregory O’Brien’s exhibition Black Windows: Ralph Hotere’s Work with New Zealand Poets was touring the country, so there were quite a few out-of-towners up in Auckland. Somehow I’d wangled the job of interviewing iconic Maori poet Hone Tuwhare for the Sunday Star-Times, and I was pretty nervous about it. He was staying with his friend (and biographer) Janet Hunt in Grey Lynn, one of the posher Auckland suburbs. There’d been a bit of a contretemps when I arrived, as they took me for a photographer rather than the interviewer, but we soon sorted that out. He was also quite deaf, and seemed to use this as a shield against foolish inquisitiveness. I worked out pretty quickly that one had to follow where he wanted the conversation to go, and that could be anywhere. “He’s one of our most political painters. I’ve always respected him for that.” That’s about as much as he would say on the subject of Hotere. As the soaking wet cat came bustling in, he bent to give it a brief cuddle in passing. “Do you have a cat of your own?” I asked. After a bit, I took out some books to show him, and that seemed to work rather better. 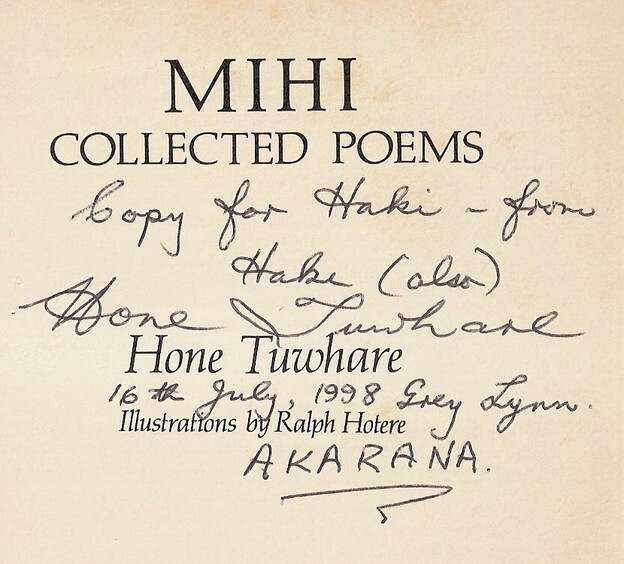 He signed my copy of Mihi, his selected poems (with Hotere illustrations), and talked and read out some of the poems: the one on fellow poet – and fellow communist – R. A. K. Mason, for instance. He was interested to hear that I lived in the same place, Mairangi Bay, where he’d so often gone to visit Mason. When he heard about the pollution problems we’d been having there, though, he was shocked. “You have to do something about it,” he said. “You can’t allow that to go on.” He showed a touching faith in my ability to effect change. Or perhaps it was that he wasn’t prepared to allow any slackness when it came to such assaults on the integrity of the land. The title poem of his first collection, No Ordinary Sun (1964) is, after all, about a palm tree poisoned by Atomic testing. He seemed happy to talk on and on, and I tried to tape it all with my little dictaphone. It wasn’t till after I got home that I realised that it had stopped working about five minutes into out conversation, so all of that priceless detail was lost. Never mind. I do sometimes regret some of the readings he did for me that afternoon, though. He seemed to love sounding out the words. Hone, who died in 2008, was definitely a political poet – one of the most radical in our history, in fact. It’s hard to know how he got away with it at times. He did have a kind of cuddly teddy-bear persona as loveable Uncle Hone which certainly fooled many people. I suppose as time went on it became less of an act and more a genuine part of his personality. As a lone Maori poet among so many Europeans, as the one genuine leftist among so many conservatives, he certainly had a complex and difficult path to tread. The traces of it are all through his poems, which operate almost like linguistic cross-sections from hieratic to colloquial. He moved like a master through all the registers of English, from local NZld to the cadences of the King James Bible. a stinging litre from a jug of wine. My memory is a sluggard. I reject your death, but can’t dismiss it. heavy traffic to a tearing halt. you’d left for her behind a photograph. ‘Bloody Ron, making up to me,’ she said, quickly. Mason was a great Latinist, a profoundly learned man, who nevertheless worked most of his life as a labourer and landscape gardener – oh, and a radical unionist. Hone, too, was trained as a boiler-maker, and lived latterly between grants and residencies and jobs here and there up and down the country. I own, and that between the toes. work yet, for the living. That “red libation” is exactly what it sounds. Mason visited China in the late 50s, and came back very impressed with what he’d seen. Hone, too, had pictures of Mao and Marx among the gallery of heroes on the wall of his little crib (South Island for “seaside cottage” – what we North Islanders would call a “bach”) at Kaka Point. The Maori word aroha translates as love, or amity; a koha is a gift, or an offering. He ended by asking me about my own writing, and told me I should send him my own first book of poems when it came out. I didn’t dare to, but wish now that I had. I did send him my own gift a few weeks later, though, a copy of Mary Barnard’s version of Sappho, as he’d said he lacked a good translation of her poems. I met him in passing a couple of times after that (once when he was in Auckland for the launch of the CD of musical recordings of his poems), but we didn’t really have the chance to speak at any length. I don’t think I’ll ever forget that rainy morning in Grey Lynn, though, the cosy kitchen table piled with magazines and books, Hone reading us out our horoscopes, Janet making us cups of tea, the cat meowing to be picked up, and that wonderful rich voice. A koha, for aroha.